Sydney Conservatorium of Music Ensembles Studies Unit. composed for Violin and Piano in 1914 and reworked for violin and orchestra in 1920. Jenny Lam (piano) is a talented musician with particular interest in classical music. She started to take piano lessons from Mr Yau Tin Fu in Hong Kong and has been playing the piano since the age of 10 years. In 1997, at the age of 18, she was the winner of both the Chinese Advance Group in the 9th Piano Open Competition and Grade 7 in the 10th Piano Open Competition, as well as the Youth Piano Competition of Asia to mark the 150th anniversary of Chopins death, in 1999. In 2001, her secondary school was awarded an Outstanding School Award in Students Attainment in Music, where Jenny was interviewed by a local newspaper in Hong Kong on behalf of her school as the representative. She is currently a fourth year piano performance student studying at the Sydney Conservatorium of Music. She learnt piano from Gerard Willems after coming to Sydney. Jenny is now learning piano from Professor Betty Vergara-Pink, an exchange teacher from the Conservatorium of Music in Germany. Thomas Talmacs (violin) is currently undertaking a Research Master Degree in Performance at the Sydney Conservatorium of Music under the guidance of Professor Goetz Richter. Having started violin at the age of five, Thomas began studies with Mr Alez Todicescu when he was twelve years old. He began studies on the viola and with Alex Todicescu he gained his L.Mus.A on violin and viola (both with distinction grade). In year eleven, Thomas won the Outstanding Performer award in the Ku-Ring-Gai Philharmonic Orchestra state-wide Concerto Competition. Thomas has performed over ten different concertos and concert pieces with various orchestras around Australia. As a Masters student and violin student of Professor Richter, Thomas is focusing on the violin concerti of Johannes Brahms, Ludwig van Beethoven and Joseph Joachim. He is also a keen organist and also acts as an assistant organist at St Marys Church Waverley when necessary. Born in Sydney, Donn Alfred Mendoza (organ) started the piano at the age of four with Ronald Barcenilla, giving his first solo performance at five. As a twelve-year old, Donn toured the Philippines culminating in a recital series with Mr Barcenilla to commemorate the 400th anniversary of the Archdiocese of Cebu, Philippines. Upon returning from his successful tour of The Philippines, Donn was appointed as Organist and Director of the Childrens Choir at the Church of Christ, Carlingford, Sydney. 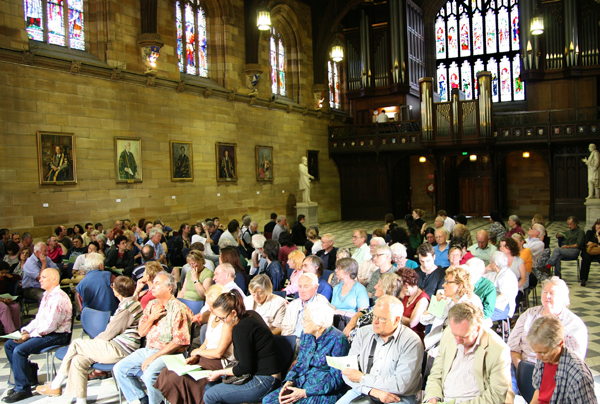 Donn maintains his interest in choral music through the university, performing with the Sydney Conservatorium Choir and Chamber Choir. In late 2006, Donn started tuition on the organ with the City Organist Robert Ampt. He was then appointed in 2007 as Organ Scholar at All Saints Anglican Church, North Parramatta, also taking the position of Organist at the Church of Christ in Minchinbury. In 2008, he began studies in Organ Performance at the Sydney Conservatorium with Philip Swanton and Continuo with Neal Peres da Costa. In late November 2008, Donn will travel to The Philippines to research and play historic Spanish Baroque Organs and other important organs of the Philippines. He will also be accompanying various choirs during his time there. Aimee Nguyen (piano) is a scholarship student of the Sydney University, studying a Bachelor of Music (Performance) under Natlalia Sheludiakova at the Sydney Conservatorium of Music. During her 18 years of playing the piano, her achievements include performing in various parts of Europe including Italy and Scandinavia, being selected for ENCORE 2005, state finalist of the Yamaha Australian Youth Piano Competition and performing Beethovens First Piano Concerto with the Sydney Youth Orchestra. She is an active member of a piano trio which won the Sir David Martin Memorial Award in 2005. IN 2007 Aimee was invited to participate in the Penrith Symphony Orchestra Young Conductors Programme. Apart from he pianist activities, Aimee enjoys playing the violin. The Greenway Quartet  Liz Gormley and Clare Miller (violins), Luke Spicer (viola) and Heather Lindsay (cello)  formed the Greenway String Quartet at the Sydney Conservatorium of Music when its members commenced their Bachelor of Music degrees in 2002. Since its formation, the quartet has been seen in regular performances around Sydney, as well as traveling extensively throughout regional Australia giving concerts and masterclasses. The quartet has also performed a number of concerts internationally, including Germany, Great Britain, Austria, Hong Kong and China. In 2006 they were featured on ABC FMs Sunday Live radio show and in 2005 they appeared on ABC televisions Australian Story, premiering works by the previously unknown Australian composer Adolph Beutler. In 2006 they were awarded first prize in the Musica Viva Award for Chamber Music at the McDonalds Performing Arts Challenge. 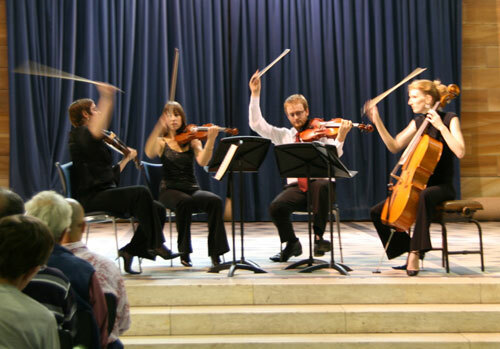 In 2005 the Greenway String Quartet were finalists in the prestigious Australian Chamber Music Competition held in Melbourne, where they competed as one of only four string quartets selected from the Asia Pacific region. 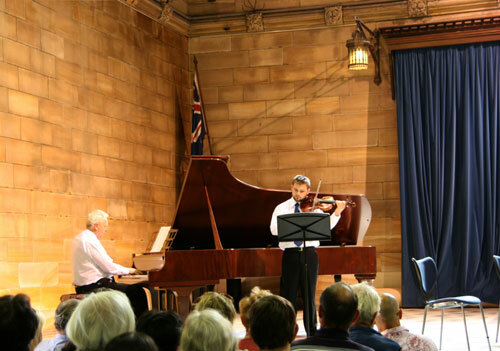 Other awards include the Wal Hardwick Memorial Award for Chamber Music (2003, Sydney Conservatorium of Music) and the Sir David Martin Award for Excellence in Chamber Music (2004, City of Sydney Eisteddfod). Throughout 2006 and 2007 the quartet participated in a year of exchange, where they studied with major European teachers at both the Hochschule for Musik, Freiburg (Germany) and the Royal Northern College of Music, Manchester, England. At present the quartet members are completing postgraduate studies and performing casually with major orchestras around Australia. David Miller (piano) is widely recognised as one of Australias leading chamber musicians and vocal accompanists, and has been appointed as a member of the Order of Australia for his service to music. His distinguished career has included partnerships with many internationally renowned instrumentalists and vocalists. His busy performing schedule has taken him to the United Kingdom, New Zealand, Asia and the Pacific Islands as well as through most parts of Australia. He also works for the ABC and Musica Viva Australia, and records for Tall Poppies and ABC Classics. David Miller has been on the staff of the Sydney Conservatorium of Music since 1980 and in 1995 was appointed the first chair of the Ensemble Studies Unit, with responsibility for the administration and teaching of chamber music and piano accompaniment throughout the institution. His studio has produced many of Australias finest piano accompanists and he has been instrumental in setting up the Geoffrey Parsons Australian Scholarship to assist all young accompanists and repetiteurs in the development of their careers. He is also currently the President of the Accompanists Guild of New South Wales. We will remember them: Two commemorations: the birth centenary of Olivier Messiaen and the 50th anniversary of the death of Vaughan Williams - shared a concert in Sydney University Great Hall by the Conservatorium Ensembles Studies Unit controlled by pianist David Miller, and 19th annual Glebe Music Festival. Each composer was represented by three works. From the French master came a piano rondo (played by Jenny Lam), No. 2 of the 20 "Regards su l'Enfant Jesus", and the heavyweight for organ "Apparition d'Eglise Eternelle" (Dom Alfredo Mendoza). From the English master came the "String Quartet No. 1" of 1909 (violinists Liz Gormley and Clare Miller, violist Luke Spicer, cellist Heather Lindsay), the violin/piano version of "The Lark Ascending" (Thomas Talmacs, David Miller) and the organ prelude "Rhosymedre" (Mendoza). All performances were worthy of respect by an audience exceeding 150.